I just Googled the word recipe and got almost 3 billion results. Definitely, there is no shortage of recipes to prepare just about anything from a simple boiled egg to Baked Alaska. Like most people, I consider myself a basic cook; nothing fancy or too difficult, just good, healthy eating. Basic cooks can do amazing things with a good recipe and a little time. While I do use recipes for certain dishes, especially something new, preparing delicious, healthful food doesn’t always require the formality of a step-by-step recipe. I suppose confidence in the kitchen comes with experience, but you don’t need too much experience to put together delicious meals and snacks. Whether you are short on time or out of ideas consider these no-recipe-required meal ideas. They really aren’t anything new, just getting back to basics with nutritious whole foods and flavors. Let’s start with lunch. Why lunch? For starters, many people eat lunch away from home. Making your lunch rather than buying out is more economical. Furthermore, it is probably the easiest meal to make. Best of all, you have control of the calories, nutrient content, and portion compared to eating out. Think about typical lunch meals eaten out – sandwiches, wraps, salads, and soups. It is amazing what American consumers will pay for someone to make them a sandwich or a salad. For that money you can make your own lunch for almost week. Plus it will be much healthier. Plenty of research has shown that consuming a diet based on a healthful eating pattern of nutrient-rich foods that supports a healthy weight promotes wellness and prevents disease. However, there are other considerations such as cost and convenience that impact what we eat. Cooking is the activity that combines all these elements, and more, as we contemplate our next meal. Consider these healthful no recipe required lunch ideas. They may not be fancy with a long list of ingredients, but they taste good and are quick to fix. Mix and match to explore different flavors and textures. What’s for lunch today? How about America’s original lunch – the sandwich. Check out these easy no recipe required ideas. Whether for home or away, they are certainly more nutritious and economical than buying out. Remember to transport your food in an insulated container with an ice pack to prevent growth of harmful bacteria that can cause foodborne illness. As the saying goes, a sandwich is a filling between two pieces of bread or one piece of bread for an open-face sandwich. Today, we have so many options besides sliced bread to make sandwiches. Some examples include English muffins, focaccia, flat breads (chapatti, lavash, naan, tortillas, etc.) pitas, rolls, and wonton wraps. 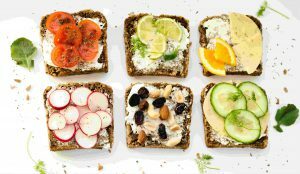 It is important to consider bread products in bigger terms, especially if you are following a gluten-free or low-carbohydrate diet. In general, most bread products are made from one or more grains; most common is whole wheat. However, that is quickly changing with consumer demand for bread products made with other grains. Currently, you can find bread products made from all kinds of grain. Consider your options and make sure to always choose bread products made from whole grains with plenty of fiber. Don’t Want a Bread Sandwich? Try Fruits and Vegetables Instead. Sturdy fruits and vegetables work the best because they can be easily sliced and hold their shape for fillings. They can usually be eaten with your hands or with utensils, if needed. You can use a variety of fruits and vegetables to surround the filling and spreads, just like a traditional sandwich. Sliced vegetables that work really well include grilled eggplant, grilled portabella mushrooms, bell peppers, cucumbers, sweet potatoes, and summer squash (yellow and zucchini). 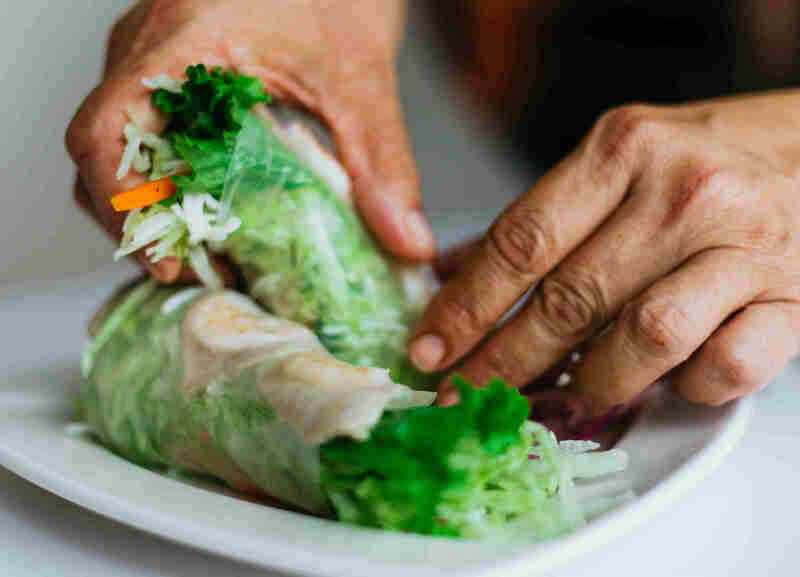 Cabbage leaves and sturdy lettuce leaves like romaine are commonly used to wrap fillings. Make sure the lettuce leaves have been cleaned, thoroughly dried, and crisp before filling. Try apple, banana, pear, and pineapple slices for a nice complement to a sweet or savory filling such as hummus, ham, turkey, cheese, nut butters, soy butter, and of course peanut butter. Are you ready for something different for lunch? These meal ideas are also great for breakfast or dinner. What a deal, they are easy to prepare, healthy, economical, and portable.